When we first got a good look at Funko's new line of 6" Firefly figures, Browncoats were rightly concerned about a distinct lack of hats included with the Jayne figure - but rejoice, Firefly fans: There'll be a hatted Jayne alongside the rest of the Firefly figures when they hit in a few months. Look how happy he is! 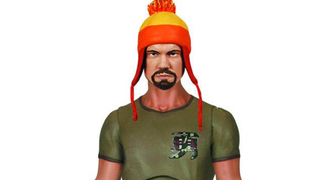 Jayne and his knitted hat will be an exclusive figure for Previews, instead of a normal release in the Firefly line. Like the base Jayne included in Funko's first wave, hatted-Jayne comes with a knife, a pistol, and his beloved rifle Vera. The inclusion of the Hat doesn't seem to have particularly pleased Jayne though, who sports a much sterner looking face that the hatless figure does! You think he'd be much cheerier with his favourite hat. Unfortunately, it looks like instead of the hat being an exclusive accessory, it's a new headsculpt on the other figure's body - so if you want a Jayne that can be both hatless and hatted, you'll have to get both. The small price to pay after waiting so long for the first proper action figures based on Firefly, I guess. Both flavours of Jayne, as well as Mal, Zoe, Wash and Kaylee will be available in May, for $20 each.